You will be able to customize your wedding with table centerpieces at your reception. A plethora of options is there if you use a little imagination! Your 5 Creative Wedding Centerpieces Wedding Centerpieces can range from the spectacular displays to the ultra-cheap DIY that will be the focal point of your reception. 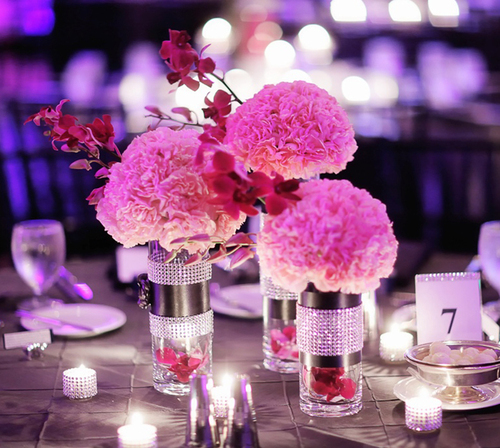 Here we have provided you with 5 of the best and unique centerpieces. Flower arrangements: Traditionally, a wedding centerpiece is made up of flower arrangements, along with confetti or a ribbon to tie the display into your other decoration. You should select blooms that will be able to compliment your wedding dress, your theme, and color scheme. You will be able to showcase your flowers amongst the 5 Creative Wedding Centerpieces in various ways: in pots, vases, bird cages, bottles, antique containers and even in something that you’ve created yourself. Candles: Amongst the 5 Creative Wedding Centerpieces the candles are another popular choice, with a wide range of styles, arrangements and designs on offer. If you wish to cut down on costs, look out for interesting containers and vessels in charity shops or antique stores which could be used as candle holders. Shells and driftwood: The shells and driftwood make excellent centerpieces can incorporate a beautiful addition to the theme of your wedding if you plan to have a beach wedding and even teacups as well as cupcakes for an English countryside wedding. Deserts: You can also make use of deserts as a centerpiece? Desserts in the form of cheesecakes, cupcakes, and smaller individual cakes can make fantastic centerpieces displayed in clever If you wish to go in for a foodie theme, flavors, snacks, and nibbles can also be an innovative way to decorate a table and that too if you are presenting them in interesting containers. Paper lanterns – budget with big impact: The simple paper lantern will be able to pack a huge decorating punch with regards to the 5 Creative Wedding Centerpieces. Irrespective of the fact that you are decorating a dance floor or a dinner table the rice paper lanterns will delight as well as dazzle your wedding guests. You will also be able to get them in a wide variety of sizes, colors, and styles. You’ll be able to come across a perfect centerpiece for every wedding which can be as simple or as complex as you like and it can also great fun coming up with a great, creative wedding centerpiece idea.